Good tones and build quality. A little generic, issues with fret polishing. The wallet-friendly BR-40 from Blueridge is a vintage-inspired guitar with a feature set that is about as simple as it gets. 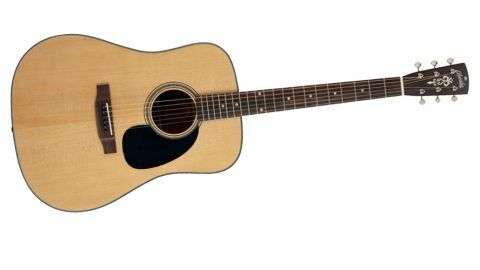 You’ve got a solid Sitka spruce top nestled on a laminate mahogany back and sides, which is a little bit disappointing at this price in all honesty, as there are some very competitively-priced all-solid instruments out there these days. However, a quick internet search reveals that this guitar can be found much cheaper than the price suggested above, so shopping around definitely pays off. Elsewhere, a mahogany neck is topped by a rosewood fingerboard, which has also been used for the bridge, together with a bone nut and saddle. What’s more interesting is the bracing pattern, which Blueridge describes as an authentic pre-war, forward-X design. This style of bracing is used across the entire range of Blueridge guitars, so to see this applying to the most budget-oriented model as well as the most elaborate is very pleasing indeed. The body is wrapped in a tortoiseshell-style binding mixed with black and white plastic layers across the top, and finished in a decent quality gloss - a little bit of buildup around the neck joint and a few inconsistent spots, but nothing worth worrying about. The soundhole rosette matches the binding design with the black and white layers, adding up to a simple but traditional vibe, visually speaking. The only flaw we’d point out with the guitar’s construction is the quality of the frets, which remain fairly scratchy when using vibrato or attempting a string bend - however this is common among guitars in this price range. The tone that rings out from a first cursory strum is full-voiced, balanced and harmonious - exactly what you would want from a budget dread. The voicing is as classical as its looks, with a tone that suits just about any style of playing. Strummed passages are balanced and even across all the strings, and despite the partly-laminate construction, the notes are distinct and avoid getting muddy or blurred, even when played with gusto. That’s no mean feat for a guitar with this kind of construction, which would imply that the effort put into the guitar’s bracing pattern and overall construction has most certainly paid off. The low-end is clear and snappy rather than room-filling and rounded, which is what you’d expect from this tonal combination, and it means that the BR-40 is an ideal partner for those planning to sing as they play or combine with other musicians. The highs similarly just stay on the right side of the tonal balance to offer plenty of sparkle and zing without sounding sharp or brittle. It’s a tonal balance that fits in wherever it’s needed, and that’s exactly what it should be.